Register Log In ECN Forum Forums Non-US Electrical Systems & Trades Floor-mounted Outlets? I was talking to an Electrician this morning that had just come from a house where the owner had installed some single socket-outlets into the timber floor at his house. The Electrician was asked to certify and connect all of the work in the house. Now, what the Electrician was wondering was, is this legal?. I said to him that the guy that installed the points, had obviously not read ECP51 (Code of Practice for Work by Owners of Residential Premises). Socket-outlets shall not be mounted on the floor. However, I'd beg to differ with this, considering that all new socket outlets require RCD protection these days and they also incorporate safety shutters. Sure the guy may have mucked up, but has he?. In commercial installations here, you see a lot of floor points in shops and offices, usually used to power vacuum cleaners and the like. And with the types I've seen, none of them have safety shutters or RCD protection, it isn't required in Commercial installations. It doesn't mean any less that little Johnny won't shove his Mum's car keys into the socket while she buys something at the counter. One last thing, what's the difference between a socket-outlet mounted into the floor and a multi-box lying on top of the floor?. Would you get away with points in the floor where you come from?. Sure, but they have to be a special type, usually with a spring loaded watertight metal cover lid. And judging by their shape they're installed in special boxes too. Yeah we've got plenty of floor sockets, they're a special unit though. They're not waterproof, but you just don't install them in places where they're likely to be soaked with buckets of hot water. Personally, I don't like them having injured my foot by stubbing my toe on one that had the lid slightly raised up when a plug was inserted. But, if they're an absolute must i.e. you need power and there are no near-by walls or other alternatives, I guess they're an ok sollution. Just don't stub your toe! Trumpy, I have read in the regs or the standards somewhere that socket outlets cant be mounted on a floor unless they are the specific floor-mount type, which have a higher impact resistance and a lid. 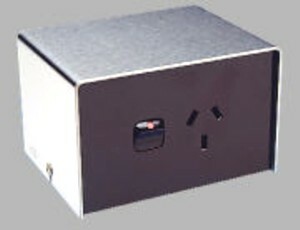 PDL makes a small, floor surface-mount bollard that allows 2 or 4 wall mount sockets to be mounted on it. These are handy when you haven't got a cavity in the floor to mount a flush floor type. Don't think for a second, that I'm having a go at you because of your post above. Yes, I've read sort of the same thing, but the quality of Electrical fittings are a lot better these days, than what they have been in the past. The impact standards these days are more than surpassed with the majority of fittings I've used. I even watched an Apprentice builder once, not long ago, try and destroy a PDL Double socket-outlet with his Estwing hammer, during a demolition job. He merely dented the front of it,after 5 minutes of pounding it, I told him to stop, as it was still live. I really can't see the need for a lid over the sockets. Safety shutters do the same job and without a lid that will no doubt be torn off in the future. If you've ever tried to insert a Duspol tester into a shuttered socket, it's hard enough with 2 pins, without worrying about a single pin intrusion. I can see where the Regs are coming from though, but is it time that the Regs and Standards started moving with the current field to which they are applied?. It would be good if they actually asked the whole Trade here (maybe via On-line Poll), instead of just a few of the highest ECANZ members on the EWRB. BTW, unless you can find a better pic, kiwi, here is what I came up with, made more for Commercial installations. I can't sort of picture this in the middle of my Lounge floor. Yes Trumpy, the floor bollard types would definitely be out of place in the living room. They are for offices where they can be placed under desks and work-stations. I can't see a reason for the lid either, the socket shutters that became mandatory in the late eighties seem to negate the need for a lid. DJK will agree too because he has injured his foot on one of these things. I totally agree with you Trumpy when you say that the governing bodies need to consult the industry on regulatory matters. The "online" consultation you referred to definitely worked when the EWRB tried to introduce an exam for practising licence renewals here and was quickly knocked back by the online submissions from sparkies that the EWRB asked for. As for the floor-mount socket outlet debate though, perhaps one of the other ECN members can tell us why these sockets should have a lid and why the plastic wall-mount sockets impact rating isn't enough ? ? I think the reason for the lid is to prevent the socket being stood on i.e. the plastic parts on the socket face might actually push out of place or crack if they had weight, from say a high heel, right in the centre of them. The NZ version, however, doesn't seem to have any plastic on the face at all. Shutters have always been mandatory on those BS1363 sockets. So the lid's nothing to do with protecting kids from shoving something into them. They're as likely to do that with a wall socket as they are a floor socket. If there is a schuko or French version you'd have to have a lid or you'd fall in! I also suspect that the lid prevents it from gathering dust and generally looking ugly too. Thats right DJK, the flush floor mount socket outlets in NZ are made of die-cast metal. The question here is : Can our plastic wall mount socket outlets withstand the impacts experienced by the floor mount sockets ? ? I think not. The plastic wall mount sockets incorporate a switch which would easily be dislodged by a high-heel ( good scenario DJK ! ) or even worse, a couch leg with 3 people on it. I agree with Trumpy that the plastic face of the socket is up to the task, but I think the switches are the achilles heel. Floor mount sockets don't have switches. As for the lid, DJK suggested that they keep dust off the contacts. It would make sense that clean socket outlet contacts function better than dust-covered contacts. Next visit to my saw-doctor, I'll get a pic of a French method of a 'floor' supply. Stand by to be aghast-ificated!